This lab introduces students to the concepts of polymorphism, early binding, late binding, abstract classes, and virtual class functions. This will be done in the context of performing calculations on basic geometrical shapes. 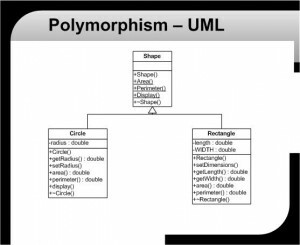 Polymorphism is a very powerful extension of inheritance, and by using pointers to the base class, it allows access to derived class objects and their functions based on the context that they are called in. The lab will require the creation of a base geometric class, called Shape, and two sub classes, Circle and Rectangle, that are derived public from the class Shape. 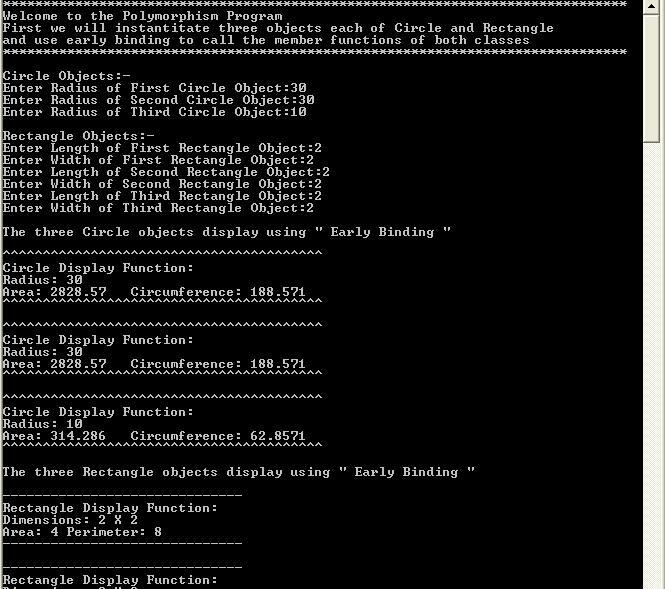 From there, objects of both the Circle and the Rectangle classes will be created, as will an array of pointers to the base class Shape. By using the instantiated objects and the object pointers, both static and dynamic binding will be demonstrated. 1. Submit a single NotePad file containing the source code for all the lab files to the Week 7 Dropbox. Your source code should use proper indentation and be error free. Be sure that your last name and the lab number are part of the file name: for example, YourLastName_Lab5.txt. Each program should include a comment section that includes, at a minimum, your name, the lab and exercise number, and a description of what the program accomplishes. 2. Submit a lab report (a Word document) containing the following information to the Week 7 Dropbox. o	Include your name and the lab or lab exercise number. o	Summary and Conclusions: Write a statement summarizing your predicted and actual output, and identify and explain any differences. For conclusions, write at least one nontrivial paragraph that explains, in detail, either a significant problem you had and how you solved it or, if you had no significant problems, something you learned by doing the exercise. o	A UML Diagram: This should show all the classes, class members, access specifiers, data types, and function arguments, along with all of the class-to-class relationships. o	Answers to Lab Questions: Include the answers to all the lab questions that are asked in the lab steps. Create a new multifile project with three classes: the base class Shape, the class Circle (derived public from Shape), and the class Rectangle (derived public from Shape). The classes will have the following requirements. 1. The class Shape should be an abstract class with the following pure virtual functions. 2. The class Circle should be derived public from the class Shape and override both the area() and the perimeter() functions. a. The perimeter() function should correctly calculate the circumference of a circle, given a radius. c.	Include all the necessary accessor and mutator functions to accomplish the requirements of the class. 3. The class Rectangle should be derived public from the class Shape and override both the area() and the perimeter() functions. a. The perimeter() function should correctly calculate the circumference of a rectangle, given its dimensions. b. The area() function should correctly calculate the area of a rectangle, given its dimensions. Instantiate at least one object of each of the Circle and the Rectangle classes. Provide appropriate constructors for both that will accept the necessary initialization arguments to provide the information required for all the class member functions. Exercise and test each member function of both classes for correct calculations and output. Add to the test function a base class array of pointers of the same dimension as the total number of Circle and Rectangle objects that were created in the previous step. 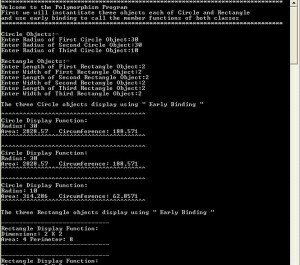 Use this pointer array to access the Circle and the Rectangle objects to call a new, nonclass member function that will display all the information about each object. 1. Circle objects should display radius, circumference, and area. 2. Rectangle objects should display dimensions, perimeter. and area. The information-display function should accept as its calling parameter a pointer of the class Shape. Run the test function to demonstrate static (early) binding using the derived class objects calling their member functions, and run the test function to demonstrate dynamic (late) binding using the assigned Shape class pointers to call the nonclass, member-display-information function.